Thank you to Octopus Publishing for sending me the 5:2 Cookbook by Angela Dowden to review. Being paperback it's hard to read whilst following a recipe and I do prefer pictures (being a food stylist!) but for £7.99 you get a whole range of recipes as well as a guide to the 5:2 diet, with plenty of information and advice on how to follow it, tailor it to suit yourself, and a very positive and healthy attitude for sticking to a lifestyle choice rather than a weight-loss fad. 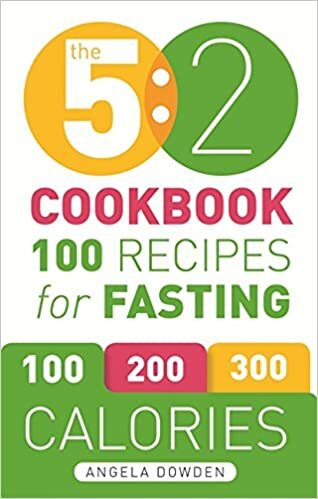 Good recipes though, giving the number of calories per dish as required on the two days of the week when you are fasting. Also fast day meal planners which help and which you can change to suit yourself, depending on whether you have breakfast or lunch or supper or a combination of each. It is divided into 100, 200 and 300 calorie meals (and snacks up to 50 and up to 100 calories) which you can mix and match to create your own 500 calorie-a-day food plan. I have somewhat of a muffin-top which I would like to dispose of, but I also think that following this plan, rather than a 'diet', is much more sustainable. You will 'starve' yourself for a day but you know you will be able to eat whatever you want the next day, so it's not as unattainable as the usual 'I'm never drinking again' or 'I'm giving up sugar' or any of those diets where you decide you will never have chocolate again, so it is much easier to keep up as a lifestyle choice. I know several friends who are following it rigourously and claim to feel healthier. And have lost weight. Even if you are not trying to lose any weight, you can still feel the benefits by doing one day a week. So choose your day. Stick to it. Just for one day. Then do it again a week later. It's not that hard! And with a book like this with some recipes that you can actually enjoy, it can happen. You will feel so virtuous. I will report back with de-muffin-top-development. I can feel it going already. Mix together the ingredients for the marinade in a large non-metallic bowl. Add the fish, courgette, onion and mushrooms and coat well. Cover and leave to marinate in the fridge for at least an hour. Brush the rack of the grill pan lightly with vegetable oil to prevent sticking. 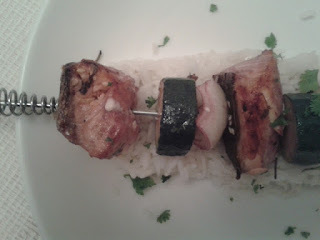 Thread 4 skewers alternately with fish, mushrooms, courgettes and onion. Brush with oil and cook under a preheated hot grill for about 10 minutes, turning the skewers frequently until cooked through. Serve hot. 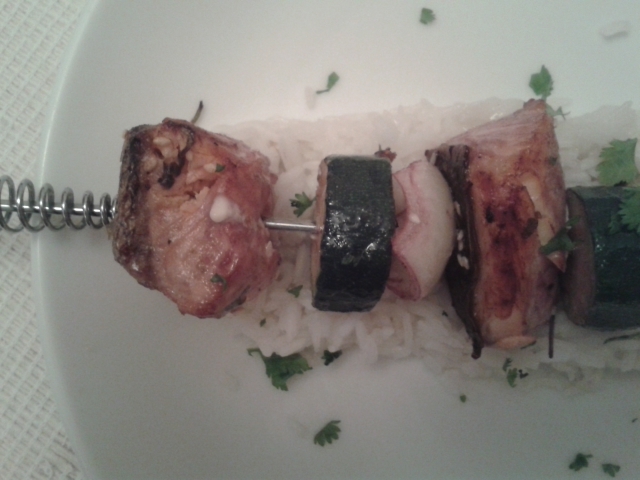 This was a quick and very tasty dish, which can be adapted to various different types of fish. If you haven't had your full quota of calories for your fast day, you can even have a little rice with it... Delicious! The perfect end to a hungry busy day. Lay the chicken fillets on a chopping board and slice each in half horizontally. Place in a large shallow ovenproof dish in which the fillets fit snugly. Mix together the soy sauce, sugar, garlic, vinegar, orange juice and pepper and pour the mixture over the chicken. Cover and leave to marinate in the fridge until ready to cook. Bake in a preheated oven 180c (gas 4) for 30 mins until the chicken is cooked through. 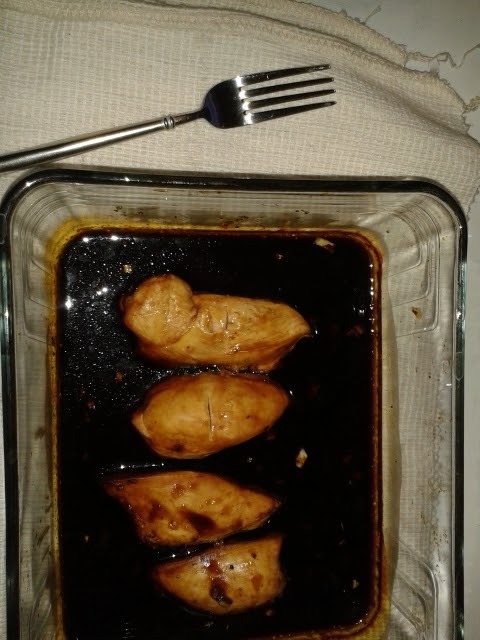 Serve the chicken with the cooking juices spooned over..
Ah! I'm sort of following 5:2 using an article I knicked from my mum out of a paper, and I was thinking about getting a book to keep myself going on it so may be this is the book I need! It may well be! It does give you meals to look forward to and very good guidelines.